Under Construction. Estimated completion end of May. Adorable bungalow situated on a quiet street just a few blocks from Busch Gardens, with USF, MOSI, the Hillsborough River, parks, medical facilities, shopping and dining all nearby. With I-275 a mile away, Downtown Tampa, MacDill Air Force Base, several airports, and pristine Gulf Beaches are just a short drive away. 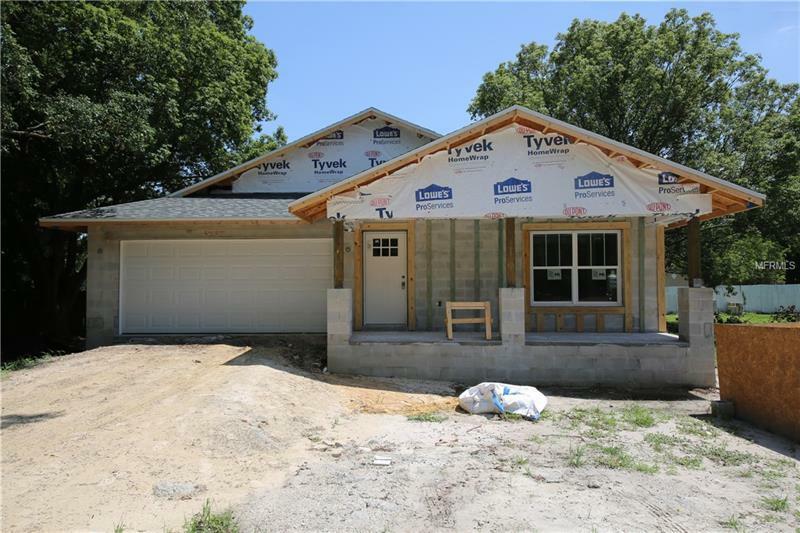 Inside, you'll find an open floor plan with upgraded lighting and ceiling fans, and luxury vinyl plank flooring with carpeting in the bedrooms and tile in the baths. The spacious, eat-in kitchen features white shaker-style cabinetry, granite countertops and all stainless steel appliances, including microwave and refrigerator. An interior laundry is conveniently located off the hallway, the master bedroom has a walk-in closet and private bath with subway tile, and two secondary bedrooms share an add'l full bath. Both bathrooms are outfitted with white shaker-style cabinets and marble countertops. In front, you'll find professional landscaping, decorative plank siding and a covered front porch with brick accents; in back, a covered porch overlooking a yard with room for pool and outdoor activities. Add'l features include a two-car, attached garage with opener, stem-wall foundation, energy-efficient, double-pane, insulated windows, 15 SEER heat pump, 50-gallon water heater, R30 insulation in ceiling and R4.6 in exterior walls, dimensional shingle roof with 30-year asphalt, fungus-resistant shingles and more. Contact agent for details and contract instructions.